​ This was a week long cruise to Bermuda from Cape Liberty, New Jersey. The tone of this voyage was set when the captain turned the ship left when exiting the berth at Cape Liberty. Normally, ships sailing from Cape Liberty turn right towards the Verrazano Bridge and the exit from the harbor. However, Summit wanted to give its guests a close up view of the Statue of Liberty and of lower Manhattan before turning around and exiting the harbor. No matter how many times you have been there, seeing these sights is always exciting. This maneuver is not something that is listed as part of the voyage. It can only be done when weather and traffic conditions permit. But the fact that Summit did this indicates a desire to go beyond what is required and expected. This attitude was also reflected in various ways throughout the cruise. Officers and crew were genuinely friendly and routinely did little things to make the cruise more pleasant for the guests. Summit is on the verge of becoming a small ship. When she entered service in 2001, she was a relatively large ship. For most of her career, she had been a medium size ship but as cruise ships have continued to grown in size, Summit has become relatively smaller even with the various additions that have been made to the ship over the years. Throughout this cruise, Summit was accompanied by the giant Norwegian Breakaway, which guests often cited as being too big for their tastes. In general, the guests were educated Americans and Canadians who were more interested in a relaxed but elegant atmosphere rather than in having a large catalogue of features. While there were some children and young families aboard, most guests ranged from 40s to 60s. Summit was in good condition. The public areas were clean and well-maintained as was my cabin. The exterior superstructure did, however, have more rust spots than one usually sees. Because a ship lives in a wet salty environment, rust is a constant problem. Like tooth decay, it can get out of hand without regular attention. Summit has not gotten to that state yet but some paint would be a good investment. The itinerary included three sea days (two going to Bermuda and one going back) as well as three days in Bermuda. Inasmuch as the weather was fine throughout, the seas did not test Summit's nautical qualities. Nor was Summit called upon to use her speed, which is better than that of most cruise ships. In addition to production shows by the ship's singers and dancers, two stand-up comics appeared in the main theater. There was also a show featuring three female singers in concert and the same venue was used for the popular Liar's Club, game show. The singers and dancers also performed mini-shows in the ship's observation lounge in order to kick off a Motown theme party. They also appeared at the deck party that was held during one of the nights in Bermuda. As befits a premium ship, Celebrity Summit had enrichment lectures on the sea days. These included talks about the history and natural wonders of Bermuda. Although this was not a Caribbean cruise, there was also a speaker who talked about and gave demonstrations on steel drums. Such talks are interesting, often fun and advance the cruise experience beyond what is provided by port shopping talks and ill-disguised sales talks often offered by cruise ship spas. Celebrity has taken a section of unused open deck space and turned it into the Rooftop Terrace. A large LED screen has been installed there as well as soft loungers and cabanas. Movies and other programming are offered here during the day and into the evening. Celebrity Cruises has traditionally been quite strong in dining and Celebrity Summit is continuing that tradition. There are numerous dining choices and the dining experience ranges from above average to excellent. The ship now has three main dining rooms. The arrangement is similar to the Cunard ships in that which dining room that you are assigned to depends upon your cabin category. At the top is Luminae, the dining room for the suite guests. Access is limited to about 130 guests staying in certain suites categories. The room is open for breakfast, lunch and dinner. It is an intimate room done in a contemporary but stylish way. The waiters are dressed in suits and ties making it reminiscent of the iconic Four Seasons restaurant in New York City. Because of the intimate size guests can and do hold conversations with the adjoining tables. For dinner, Luminae presents a six course fine dining experience. Each of the dishes that we sampled were excellent with interesting contrasts of flavors. Guests who want more standard fare, can order from the always available section of the menu from the Cosmopolitan Restaurant. In sum, Luminae is very competitive with the suite class restaurants that we have tried on other lines. Blu is unique to Celebrity Cruises. It is the restaurant for guests staying in Aqua class cabins. The food is designed to be healthier than typical restaurant food. However, this does not mean that Aqua class guests are relegated to eating nuts and berries. Rather, Blu makes creative use of spices, sauces and ingredients to turn conventional dishes into healthier alternatives. If someone didn't tell you that these dishes were designed to be healthier, you would never know it from just tasting them. Again an excellent venue. Like Luminae, the Blu on Summit is an intimate room. Signature décor first developed for the Blu restaurant on. Celebrity's Solstice class ships has been installed. It is a very pleasant dining experience. The large main dining room is the Cosmopolitan Restaurant. A grand room, two levels high, the signature feature is a statue at the base of the sweeping staircase that was taken from the SS Normandie, a 1930s ocean liner which was known for its exquisite art work. Open for breakfast and lunch (sea days) on an open seating basis, guests assigned to this restaurant can choose either a flexible dining system or the traditional passenger ship dining system for dinner. The flexible dining system is more popular so guests selecting that system are seated on the main level of the dining room. Traditional guests are seated in the balcony. The dinner menu bifurcated. Guests can chose from a list ofitemns that changes each night. Alternatively, there is a list of items that remains the same each night including such favorites as escargot, shrimp cocktail, steak and grilled salmon. Overall, the dishes were better than average cruise ship fare. Some were quite good but there was the occasional disappointment. The staff were quite willing to exchange any item that disappointed for another more pleasing item. We found the service to be good. However, we did hear some complaints from other guests, particularly about the seating at peak times on the main level. ​Celebrity Summit has two specialty restaurants. Quisine is a concept first developed for Celebrity Eclipse and which has since been rolled out to several other Celebrity ships. It is designed to be an unusual experience featuring dishes that defy categorization. Most guests simply let the waiters bring an array of the most popular dishes although you can select which items you want on an Ipad. The ship's original specialty restaurant was the Normandie Restaurant. The décor of this venue included panels taken from the SS Normandie. To give an idea of the significance of this art work, other panels from the Nomandie are in the collection of the Metropolitan Museum in New York. In keeping with the grand luxe style of the Normanie, the restaurant offered a multi-course fine dining experience based upon the menu of the Murano restaurants on the Solstice class ships. In view of the popularity of more casual dining, Celebrity has replaced the Normandie Restaurant with the Tuscan Grill, a concept that debuted on Celebrity Solstice. It is a steakhouse with elements of Italian cuisine added. Reflecting the cruise industry's worship of the concept of branding, the Normandie panels have been replaced with design elements taken from the original Tuscan Grill on Solstice. The Nappa Valley atmosphere is pleasant but cannot begin to compare to what had been there before. Furthermore, the most attractive feature of the Tuscan Grill on Solstice was the natural light and view provided by the room's large windows. On Summit, the windows are covered by shutters with fixed slats that block both light and view. The restaurant itself is comparable to the steakhouses on other cruise ships. Tender, nicely cooked beef. Whereas the steakhouse and the Italian cuisine held equal status in the original Tuscan Grill concept, the Italian items now play more of a supporting role as first courses and side dishes. Good, but not particularly memorable. In addition to the specialty restaurants, Summit offers a dining experience called “A Taste of Film”. Held on the Rooftop Terrace, this experience includes a movie shown on the ship's giant LEC screen and an array of small plates that are served during the movie. The dishes are geared to reflect the theme of the movie. For example, during the showing of “The Hundred Foot Journey,” a film about an Indian chef's experiences in France, the dishes came from Indian and French cuisines. It is very nice to relax in the soft cushions of the loungers under a starry sky while watching a film. Furthermore, each of the dishes were quite good. A word of caution, however. If you are a serious film buff who likes to be totally absorbed in the reality of a movie, this may not be for you. Although the servers try not to be intrusive, the arrival of each dish does break the spell of the film. At the same time, if you are a more casual film-goer who likes to nibble on something during a movie, this experience takes it to a new level. Summit also has several casual dining venues. One deserves special mention. Open for breakfast and lunch, the Spa Cafe offers light dishes consistent with a healthy lifestyle. They are often quite creative, mixing flavors and freshness. For lunch, the Spa Cafe offers a number of hot items that are cooked ala minute as ordered. Give your order to one of the staff behind the buffet counters and ten minutes later, you have a freshly cooked main course. The jewel in the crown here is the grilled salmon fillet. Simple but bursting with flavor. Combine it with one of the pre-made dishes or the mix your own salad and you have a full meal. Located in the indoor pool area, the Spa Cafe is not an impressive looking venue. In fact, it just looks like a buffet counter. More significantly, because of its location, it is hard to find a place to sit especially on sea days when the indoor pool area is busy. Thus, it is best to plan on taking your meal to another location. 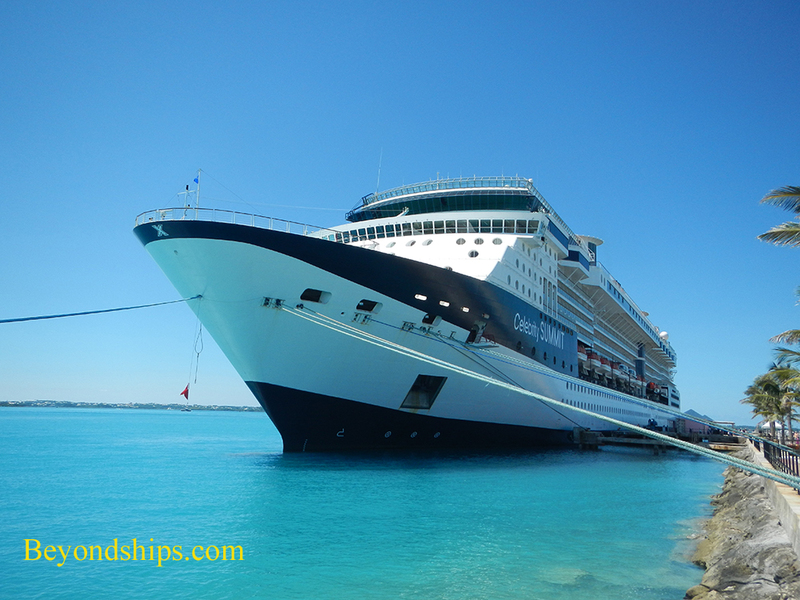 The only port of call on this cruise was Bermuda. However, we had three full days and two nights to enjoy the island. Celebrity Summit docked at the Royal Naval Dockyard in western Bermuda. The Dockyards has been transformed over the last 20 or so years from a derelict 19th century naval base into a pretty cruise port with shops, bars, cafes, activities and Bermuda's National Museum. You could spend your entire time in Bermuda there. But Bermuda has so much more to offer. People often assume that Bermuda is just another Caribbean island. However, it is not located in the Caribbean and because it is more prosperous than most Caribbean islands, it has a much different atmosphere. Not as British as it used to be but rather increasingly unique. Most people go to Horseshoe Bay, Bermuda's best known beach. It is easy to get to from the Dockyard by public bus or by using one of the mini-van shuttles, which take you directly to the beach. Rather, than stay at Horseshoe, I prefer to walk along the trail that connects the various South Shore beaches. They are less crowded and the rock formations surrounding the beaches are incredible. (See separate article). The second day, I took the fast ferry into Hamilton, Bermuda's only real urban center. It is a clean town, easy to walk around. On this occasion, the US Coast Guard training ship Eagle was in port and I went aboard to have a look around this tall sailing ship. On the third day, I took a shore excursion that centered upon a walk along the right of way of Bermuda's old railway. (See separate article). ​Throughout our stay in Bermuda, the weather was sunny. However, in the summer, the humidity can be intense in Bermuda. This does not prevent people from doing things but rather requires extra care to prevent dehydration and to keep from overdoing things.